Apple is reportedly coming to town, or at least considering it, and state lawmakers are tweaking the state budget to lure the corporate giant with a new package of incentives. Unfortunately, when one examines the latest proposal released by Senator Berger and Speaker Moore in today’s budget, it’s hard not to be reminded of the old “Looney Tunes” cartoons featuring the hapless Wile E. Coyote and his repeated and futile efforts to capture the Road Runner through the use of ever-more complex and harebrained contraptions. Over the past three years, the General Assembly has expanded the state’s flagship Job Development Investment Program (JDIG) four times in an effort to win “mega projects” that would create thousands of jobs and invest hundreds of millions of dollars in a single shot. In doing so, legislators specifically had in mind landing auto manufacturers like Volvo or global tech companies like Amazon looking to create high-wage jobs with new corporate headquarters. Last week’s announcement marks the fourth time in as many years the legislature has tried to entice these mega-projects by increasing the amount of incentive dollars available or relaxing the rules companies have to follow to receive their incentives. In 2015, the General Assembly kicked off the effort by creating a “high yield” category in JDIG that would give larger-than-normal grants to businesses that created 2,000 new jobs and invested $1 billion. Before the ink was dry on that particular plan, legislators came back a second time in a bill making “technical corrections” to the state budget and lowered the required number of jobs and investment required to 1,750 jobs and $500 million invested – in effect making it easier for companies to qualify. When the high-yield program failed to attract Volvo later that year, legislators came back again in the 2017 long session and created a new “transformative project” category within JDIG that effectively wipes out companies’ corporate income tax liability if they create 5,000 new jobs and invest $4 billion in North Carolina. The new program allows companies to receive grants equal to 100 percent of their employees’ withholding for up to 25 years—this is significantly more than the standard JDIG package which gives grants of up to 80 percent of their employees’ withholding for only 12 years. Rumor had it that legislators proposed the new program with a specific company in mind—Toyota-Mazda, which was considering North Carolina for the site of its latest North American auto manufacturing facility. But even the new “transformative” JDIG couldn’t close the deal for Toyota-Mazda, which earlier this year chose Huntsville, Alabama. Tellingly, Mazda chose Alabama instead of North Carolina, not because our incentives were too small, but because we lacked another key economic asset—an adequate supply chain able to support the new facility. Fast forward five months, and Apple is considering locating a campus in Research Triangle Park. Sure enough, lawmakers have proposed another expansion of JDIG. And while the state’s business recruiters certainly need the right tools to attract large-scale projects, this particular expansion of JDIG has more than a whiff of Wile E. Coyote about it. #1 – It allows the company to receive a lot more public dollars while taking a lot longer for the state to benefit. The new proposal effectively wipes out the company’s corporate tax liability for 30 years, while giving the company 10 years to ramp up and 20 years to create all the jobs that are promised. It also drives up the amount of public dollars the state is willing to pay for each job, by eliminating a rule that capped the amount at $6,500 per job. In effect, then, the state will be paying more for each job, while seeing fewer benefits over a longer period of time than currently permitted by state law. Instead, the proposal should ensure that communities actually benefit more from incentives, not less. JDIG and ONeNC together are only delivering about six jobs for every ten that are promised, so working on making sure companies actually follow through on their promises is the first big step for helping communities to get the most out of every deal. Although robust accountability standards protect taxpayers when the jobs don’t come through, the state needs more good-paying jobs, rather than fewer, so ensuring these projects deliver should be a top priority. An additional priority should be ensuring these companies actually hire their employees from North Carolina—and preferably from struggling communities—rather than importing them from other states. #2 – It’s another expansion of our state’s incentive programs, after several past expansions didn’t do the job. At some point, it’s important to step back and ask whether building bigger, more complicated contraptions is really the best way to catch the Road Runner. Right now, we don’t even know if incentives are the deciding factor; research suggests subsidies are decisive for just three out of every ten corporate relocation decisions. Apple may choose to locate here anyway, even without a new transformative project incentive award. Obviously, we want recruiters to have the best tools possible, and the Toyota-Mazda deal actually points the way to an alternative strategy—investing in the public institutions that build industrial infrastructure and critical supply chains, educate our kids, and train a skilled workforce, support entrepreneurship and small business development, and develop transformative industry clusters like biotechnology, aerospace, and advanced manufacturing. In effect, we can wrap these firms in productivity-enhancing assets that make more likely to stay, thrive, and grow than a simple cash award spread out over 30 years. North Carolina clearly shouldn’t abandon incentives. Even if they work only three times out of ten, that’s three projects North Carolina would not have had otherwise. But we do need to question how these tools can be deployed to maximize benefit to the state. 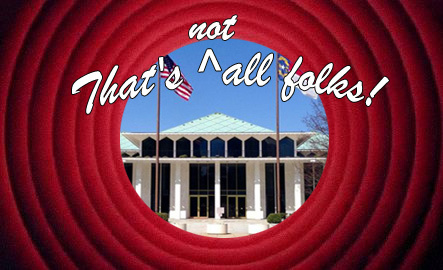 As it stands now, the current legislative proposal looks a lot more like Wile E. Coyote chasing the Road Runner than it looks like a plan that genuinely connects struggling North Carolinians to new jobs. Allan Freyer, Ph.D. is the Director of the Workers’ Rights Project at the North Carolina Justice Center.